At All Trash Oz, this is the concept of Waste Removal services. Providing fast and efficient Waste Removal services to leave your place spotless. Call now for an honest quote 0400 061 061. Household, commercial or yard waste, your waste is good hands. Your time and effort of removing your waste can be spent on more important things like spending time with your family and friends. Without the proper knowledge and equipment, as well as the manpower, the job is one that is time-consuming and back-breaking. 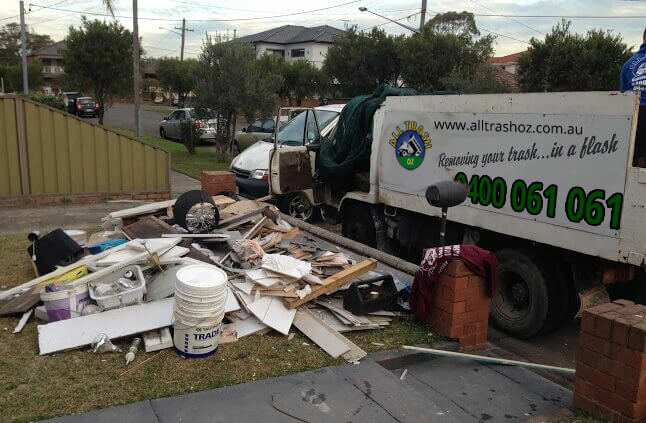 You will be given the best possible solutions in waste removal and demolition when teaming up with the best, All Trash Oz. A fast and efficient team is all that you need. No job is too big or too small, offering you the best cleanup at the lowest rate. Leave your rubbish collection to the pro’s guarantee you recycle as much of your rubbish as possible, saving you time and money. When you use the team, who love to make you smile, trust that your rubbish is handled from years of experience by the best Sydney rubbish removal men, who love what they do. Keeping your bill low through outstanding recycling process. When keeping the environment clean and your place tidy, recycling is a major key to maintaining it. So, don’t worry, you can assure that if your waste can be recycled, it will! Keeping your costs down and environment happy. Recycling reduces the carbon footprint on the environment and lessens the impact of your bill. Every customer is important, that’s why the lowest rates are here for you while ensuring your rubbish removal leaves the smallest imprint in the environment. Paper Products – Magazines, Cards, Books, Newspapers, Office Paper, Etc. Cardboard Products – Cartons, Packaging, Etc. Glass – Bottles, Jars, Etc. Metals – Soda Cans, Tin, Aluminium, Foil, Etc. The experts in Commercial, Residential and yard waste removal, guaranteeing your job is completed beyond your expectations. Caring for you by putting your needs first. Always looking out for you as the customer by recycling to keep costs down and smiles up! With an outstanding reputation in Sydney that results in fast and efficient work done just for you. Time is gold and you deserve more of it, so don’t waste it – All Trash are here to save your day. No job is too large or small for the experts at All Trash OZ Sydney. For more information on the services at All Trash OZ, contact us on the number below. Or the “Book Online” form that is located at the top right of this page. Experts are standing by to assist you.